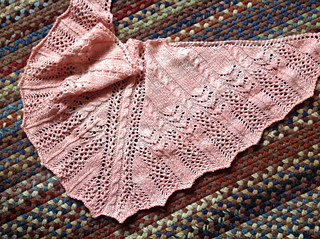 This pretty little shawlette patterns contains cable and lace, a combination that has been found to be completely addicting. The pattern includes some notes on how to make your shawl bigger. 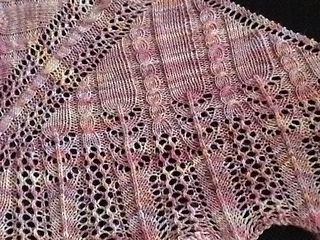 Many of the charts can be easily repeated to make a shawl uniquely yours! 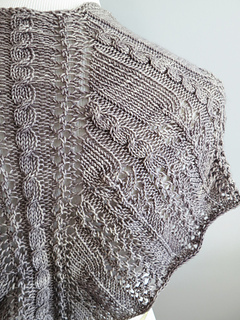 Creekwood was originally featured as Jen’s Fall 2012 Mystery Shawl. Two charts are being worked simultaneously. One chart is being worked in the 14-stitch center panel, while the other chart is being worked on each half of the shawl. To make the shawl bigger, some of the charts can be repeated. Charts A & B can be repeated together (i.e. A, B, A, B, A, etc. ), but be sure to end with chart A before moving on. Also, charts E & F can be repeated together (i.e. E, F, E, F, etc.). Remember, adding length to your shawl will affect the amount of yarn needed.